Vijay Sethupathi and the word versatility go hand-in-hand. 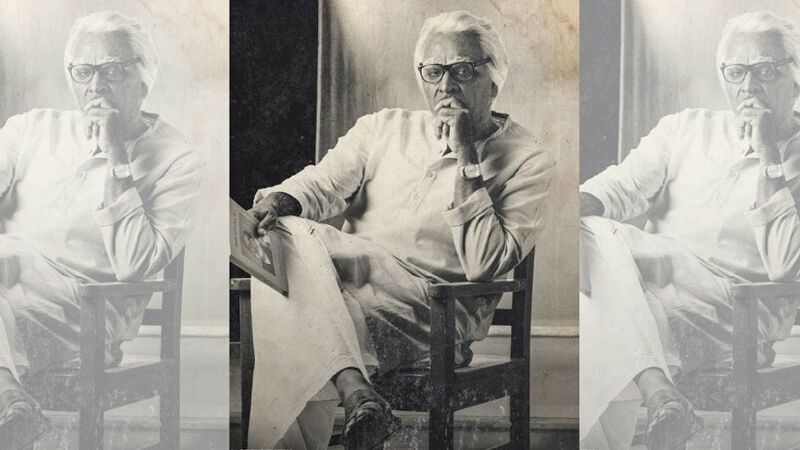 Having played a variety of roles in his short but highly impressive career so far, he will be seen playing a septuagenarian character in the upcoming Tamil drama Seethakathi, which according to its director Balaji Tharaneetharan, is not a biopic of the popular Tamil philosopher. This is not the first time Vijay Sethupathi has played an older character in his career. In Soodhu Kavvum, he played a 40-something man who makes a living out of low-profile kidnappings. He played a much older character in Orange Mittai. While it doesn’t come as a surprise he’s essaying a 70-something character in Seethakathi, the effort that he has put in to play the character does catch one’s attention. The first look poster of the film was released last week on the occasion of Vijay’s birthday. In it, Vijay is seen sporting an unconventional look — grey hair, wrinkled skin, and glasses — which could be best described as a cross between Kamal Haasan’s in Indian and Raghuvaran’s avatar in Mudhalvan. “It takes four hours to put on the make-up and another two to remove it. I was stunned by Vijay’s patience, and all that he can do to get under the skin of a character,” said Balaji. Academy Award-winning make-up artist Kevin Haney, known for his work in films such as Driving Miss Daisy and Planet of the Apes, was brought on board to design Vijay’s look. Seethakathi happens to be Vijay Sethupathi’s 25th film, and Balaji and his team are trying to make it special. “I believe audiences will love what we’ve done with his look. He is going to be presented in a way he’s not been seen before.” Veteran actor Archana plays Vijay’s pair in the film, which also stars J Mahendran, Bagavathy Perumal, Rajkumar, Parvatii Nair and Remya Nambeesan. After impressing with Kavan, Karuppan and Vikram Vedha last year, Vijay Sethupathi has a great lineup this year. One of his most exciting projects is Thiagarajan Kumararaja’s Super Deluxe, in which he’s rumoured to be playing a transgender. He also has Imaikka Nodigal, Junga, Oru Nalla Naal Paathu Solren, 96, Chiranjeevi’s Sye Raa Narasimha Reddy and Mani Ratnam’s yet-untitled project.